Large-N comparative studies have helped common pool resource scholars gain general insights into the factors that influence collective action and governance outcomes. However, these studies are often limited by missing data, and suffer from the methodological limitation that important information is lost when we reduce textual information to quantitative data. This study was motivated by nine case studies that appeared to be inconsistent with the expectation that the presence of Ostrom’s Design Principles increases the likelihood of successful common pool resource governance. These cases highlight the limitations of coding and analysing Large-N case studies. We examine two issues: 1) the challenge of missing data and 2) potential approaches that rely on context (which is often lost in the coding process) to address inconsistencies between empirical observations theoretical predictions. For the latter, we conduct a post-hoc qualitative analysis of a large-N comparative study to explore 2 types of inconsistencies: 1) cases where evidence for nearly all design principles was found, but available evidence led to the assessment that the CPR system was unsuccessful and 2) cases where the CPR system was deemed successful despite finding limited or no evidence for design principles. We describe inherent challenges to large-N comparative analysis to coding complex and dynamically changing common pool resource systems for the presence or absence of design principles and the determination of “success”. Finally, we illustrate how, in some cases, our qualitative analysis revealed that the identity of absent design principles explained inconsistencies hence de-facto reconciling such apparent inconsistencies with theoretical predictions. This analysis demonstrates the value of combining quantitative and qualitative analysis, and using mixed-methods approaches iteratively to build comprehensive methodological and theoretical approaches to understanding common pool resource governance in a dynamically changing context. In a globalizing world, historically small-scale cases of common pool resource (CPR) governance are becoming “increasingly besieged and permeated by a planetary network of interdependencies” (Beck and Sznaider 2006, 11). This presents a challenge to our ability to understand how and at what scale CPR systems can be managed effectively. Some studies have addressed this challenge by compiling and analysing databases of a large number of case-studies (e.g. Cox et al. 2010; Gutierrez et al. 2011; Epstein et al. 2014). While these studies provide helpful general insights into CPR governance, they are insufficient to explain the processes and complex linkages that constitute a governance system. To build on these studies, we need to iteratively compile and synthesize the insights gleaned from in-depth case studies, qualitative analysis, field and lab experiments, mathematical models, and statistical results (Poteete et al. 2010; Anderies and Janssen 2011). A major challenge for large-N case studies is insufficient information in a secondary source to assign a value to a “coded” variable. For example, if the coding question is “are there conflict resolution mechanisms in place”, it may not be possible to assign a coded value (e.g. 1=yes or 0=no) with available information. This could be a result of the fact that such mechanisms were in place (or not) and the original researcher was not interested in this fact. In this case, the “coded” variable is listed as “missing in case”. Short of a follow up with the original author or returning to the field, there isn’t much to do to remedy this “missing data” situation. On the other hand, the original researcher may have been interested in the question the large-N study is attempting to code, but may have taken a different methodological approach and did not present the information in a way that the coder could easily discern. In this case, it may be possible to interpret the information that is available to derive some insights about such ambiguous variables to make an educated guess at what factors may impact outcomes. This may not replace missing (coded) data, but may help augment our understanding that may have been lost in translation during the coding process. In this study, we demonstrate the methodological opportunities and limitations for supplementing a large-N quantitative analysis with qualitative analysis. The qualitative analysis was based on some of the questions that remained unresolved after a large-N case coding, and quantitative analysis, conducted at the Centre for Behaviour, Institutions and Environment1 (CBIE), at Arizona State University presented in Baggio et al. (2016). Our study further supports Baggio et al.’s (2016) findings, but it also provides nuanced account of the methodological limitations of and challenges for case-study coding and quantitative analysis by comparing interpretations based on how the problem of “missing data” is interpreted. Is the data really missing, or just lost in translation (not codable)? We emphasize the distinction between the fundamental data that is the textual account, and the coded variables that attempt to simplify complex sets of information. Our approach is consistent with the suggestions of commons scholars that we use mixed-methods and/or mixed-theory approaches to incorporate insights from various perspectives with institutional analysis and the design principles (DPs). These scholars have utilized different approaches to examining CPR governance, and have encouraged scholars to consider other important elements such as discourses, power relations, the politics of scale, and historical contingencies (Campbell 2007; Clement 2009; Gruby and Basurto 2013; Barnett and Eakin 2015). Other studies have used a small number of opportunistically selected cases of multi-level or multi-scale CPR systems and SESs to highlight the importance of including elements of adaptive governance, resilience, institutional analysis, and political ecology (e.g. Armitage 2007; Chaffin and Gunderson 2016). These mixed approaches have greatly contributed to a holistic understanding of CPR governance. However, case study comparisons have not, to our knowledge, been formally combined with large-N quantitative analysis. In this study, we examine cases where a large-N coding exercise linking DPs and outcomes was insufficient to uncover the complex relationship between CPR regime success and those very same DPs, and where a thicker descriptive method can help us fill the gaps. As part of a special feature on “context, scale, and interdependencies,” we conduct a post-hoc qualitative analysis of inconsistent cases flagged in the analysis conducted by Baggio et al. (2016). Baggio et al. (2016) showed that DPs work in combinations, and that different clusters of DPs are more likely to lead to successful outcomes. But the patterns obtained through the translation of qualitative information into coded information in the form of zeros and ones that constitute the presence or absence of a list of DPs alone is sometimes insufficient to explain the outcomes of a case study. This could be due to the context or the methodological limitations of the study. We use a qualitative approach to explore this discrepancy and better understand these cases. Why are there cases in which few DPs seemed to be present that are considered successful and why are there cases in which most of the DPs are assessed but the CPR system is not successful? At first glance, these inconsistencies would seem to suggest that the cases contradict commons theory. Our examination of inconsistent cases suggests that, in fact, they do not. Only by doing a post-hoc qualitative analysis of Baggio et al.’s (2016) quantitative study can we learn this and actually re-affirm commons theory. Further, qualitative analysis helps refine our quantitative methods, and uncover other important variables and nuances relevant to the DPs. The understanding of context and an in-depth qualitative analysis of cases that are inconsistent with the main results portrayed in Baggio et al. (2016) is, in our opinion, a fundamental step to build robust governance of CPR systems. In the next section, we summarize previous analyses on which our study is based, and define the criteria we used for selecting cases. We then discuss nine cases studies and examine why they were inconsistent with the predictions of the DPs, and make inferences on how these inconsistencies point to other important contextual variables and processes. Our analysis builds on the coding and statistical analysis conducted by our research team at the CBIE, which in turn, was built on the coding and statistical analysis conducted by Cox et al. (2010). Cox et al. (2010) coded 77 cases of CPR governance, and found evidence to support the claim that Ostrom’s DPs can predict “successful long-term environmental management.” They used a modified version of the DPs, in which three DPs are subdivided, yielding a total of eleven DPs (see Table 1), and defined case studies as empirical studies in primary and secondary literature that evaluated Ostrom’s DPs implicitly or explicitly. This analysis is limited in at least three respects: 1) because the DPs are part of a governance system embedded in broader biophysical and social systems, looking at the impacts of individual DPs in isolation is problematic, 2) there are practical challenges to coding presence/absence of DP’s and “success” of a case, and 3) how do we understand the apparent anomalies in the analysis of Baggio et al. (2016) where cases seem to succeed (or not) even when individual DPs are absent (or present). The work in this and other papers in this special feature set out to address these limitations. Baggio et al. (2016) tackles the first, Ratajczyk et al. (2016) the second, and this paper tackles the third issue. Design principles, adapted from Cox et al. (2010). 1a The presence of the design principle 1A means that individuals or households who have rights to withdraw resource units from the common-pool resource must be clearly defined. 1b The presence of the design principle 1B means that the boundaries of the CPR must be well defined. 2a The presence of design principle 2A means that appropriation rules restricting time, place, technology, and/or quantity of resource units are related to local conditions. 2b The presence of design principle 2B means that the benefits obtained by users from a CPR, as determined by appropriation rules, are proportional to the amount of inputs required in the form of labour, material, or money, as determined by provision rules. 3 The presence of design principle 3 means that most individuals affected by the operational rules can participate in modifying the operational rules. 4a The presence of design principle 4A means that monitors are present and actively audit CPR conditions and appropriator behaviour. 4b The presence of design principle 4B means that monitors are accountable to or are the appropriators. 5 The presence of design principle 5 means that appropriators who violate operation rules are likely to be assessed graduated sanctions (depending on the seriousness and context of the offense) by other appropriators, officials accountable to these appropriators, or both. Is this design principle present? 6 The presence of design principle 6 means that appropriators and their officials have rapid access to low-cost local arenas to resolve conflicts among appropriators or between appropriators and officials. 7 The presence of design principle 7 means that the rights of appropriators to devise their own institutions are not challenged by external governmental authorities. 8 The presence of design principle 8 means that appropriation, provision, monitoring, enforcement, conflict resolution, and governance activities are organized in multiple layers of nested enterprises. Ratajczyk et al. (2016) describe the coding process at the CBIE. The research team read and re-coded 69 of the 77 case studies from primary and secondary literature used in Cox et al. (2010), including the same temporal periods, and tested for intercoder reliability within the research team and between research teams. Our team defined success based on a coding of previously defined (Ostrom et al. 1989) variables related to resource sustainability, collective action, and equity among users (see Ratajczyk et al. 2016 for a detailed description). Baggio et al. (2016) used this case coding to conduct visual analyses and Qualitative Comparative Analysis to examine the interrelationship between DPs and success. The results of the Baggio et al. (2016) study indicated that DPs often co-occur, some patterns of co-occurrence are more likely to predict successful outcomes, and that principles such as congruence (2A and 2B) and graduated sanctions (5) seemed particularly important. We define the problematic observations or “inconsistences” according to a scheme based on the number of DP’s present and outcome as shown in Figure 1. Baggio et al. (2016) found that successful cases had an average of 8.7 DPs, and unsuccessful cases had an average 4.3, and concluded that CPR management may require a “pick nine or more” approach. We use a lenient cut-off for anomalous cases by including unsuccessful cases with eight or more DPs, and successful cases with five or fewer DPs to select a subset of cases to analyse qualitatively. This yielded nine cases that we considered to be “inconsistent” with the quantitative findings. These cases would be predicted as likely to succeed or fail since they fall within one DP from the average successful or unsuccessful case. Diagram outlining the method for post-hoc analysis of cases coded as inconsistent with predictions based on a quantitative large-N case study analysis. We classify our inconsistencies into two categories by considering case outcomes and DPs: Type I and Type II (Figure 1). Type I inconsistencies are cases with eight or more DPs coded that were deemed not successful. If the case studies indicate that social or ecological problems stemmed from the particular DPs absent, then this finding would indicate that all DPs are important, or that specific DPs are important in a given context. If the case studies suggest other factors as explanations for outcomes, then we should recommend more attention to external or internal contextual factors not captured by the DPs. Type II inconsistencies are cases in which coders identified five or fewer DPs, but deemed the case to be successful. In these cases, the missing data may make it impossible to explain outcomes without further examination and research. Further, the presence of missing data makes it difficult or impossible to define with certainty whether some cases are actually Type I or Type II inconsistencies rather than the result of the missing data itself. The authors of these studies may also provide evidence to suggest alternative explanations for outcomes. Whether we can consider these cases as inconsistent depends on the degree to which we can assume that missing data infers the absence of the DPs. We examine these four cases considering these constraints and relevant information below. Missing data concerning DPs. It may be that additional principles were present in the case and could not be coded from available data. Given the potential for missing data, it is very difficult to categorize a case as a Type II inconsistency unless there is definitive evidence that certain DPs were not present. Such statements of non-existence are rare unless the original study was explicitly focused on the DPs (which most are not, and none in this study were). On the other hand, general studies typically describe what is present rather than what is not, so the fact that evidence for a design principle is not mentioned may provide some support for the claim that the DP is, in fact, not present. In either case, some speculation is required. Type I inconsistencies are perhaps easier to make a case for in that DPs are coded present (so there is less of a role for missing data). However, there is still room for miscoding, either in terms of coding a case as not successful when it was or being too liberal with coding one or two DPs as present when, in fact, they were not. In the remainder of this paper, we present what we call “qualitative analysis of quantitative inconsistencies” emphasizing the multitude of problems that can creep in when quantifying qualitative data through coding and providing some pathways to gain insight based on other contextual factors. Specifically, we illustrate cases in which there is sufficient contextual information to understand success or failure of governance of shared natural and built infrastructure regardless of whether we assume “missing” DPs were present and not mentioned or were actually absent. In the latter case, we may be able to conclude that other mechanisms supplied the functions of missing DPs. In the former, we might conclude that DPs and other mechanisms that supplied similar functions provide redundancy in the system, and with it, robustness. In either case, we may gather useful new insights from this contextual data. In what follows we detail how this can be done using “qualitative analysis of quantitative inconsistencies”. Inconsistent cases can arise from several causes: 1) investigator bias in primary data analysis, 2) procedural bias in secondary data analysis, and/or 3) substantive error in which there are alternative contextual factors or multiple pathways that account for an outcome. Investigator bias refers to the fact that author(s) may observe and interpret the CPR system state based on a narrow range of theory, assumptions, and objectives (Degnbol et al. 2006; Basurto et al. 2013). An example of investigator bias is when an author examines a case without considering a full suite of relevant variables. Since large-N case studies are based on the original assessments of the investigator, these biases cannot be accounted for without further empirical research into that case. It may be more accurate to refer to large-N case studies as textual analyses of the literature on CPR governance, rather than analyses of the objective empirical phenomena that occurred in a CPR system. 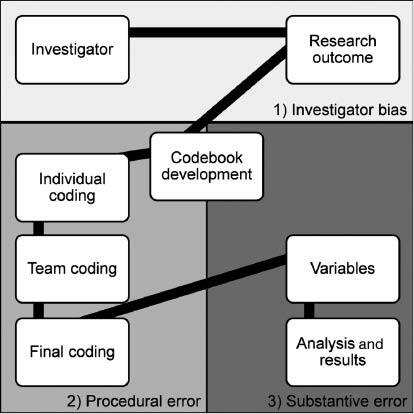 Procedural bias concerns the coding process depicted in box two in Figure 2. It is undeniable that an individual coder’s subjectivity can influence the coding outcomes. Coding involves reducing textual data into variables, and thus each coder’s biases may result in errors in how such variables are assessed. Both Baggio et al. (2016) and Cox et al. (2010) took measures to ensure consistency between individual coders in the group. However, Baggio et al. (2016) showed that coding agreement between the two studies was low. This is not an indication of better/worse coding, but of the difficulties of coding data from secondary sources and when the coding relates to what we refer to as soft human infrastructure (i.e. institutions, conflict resolution mechanism, etc.). Biases and errors that generate inconsistencies between empirical phenomena and large-N case study results. The origin of the first two forms of inconsistencies may be detectible in our analysis. First, we may find evidence to suggest investigator bias if the original study did not consider the DPs or alternative explanations for outcomes. Second, after a subsequent reading, we may find evidence for the presence or absence of DPs that contradict our coding, which would indicate procedural bias. This result would strengthen the explanatory capacity of the DPs in our conclusion, but weaken the validity of our coding. In our examination, we found that all authors of the original cases went beyond the DPs to explain outcomes of their studies, but their explanations were not exhaustive, and some DPs were not discussed. This suggests that while investigators did consider some DPs and alternatives, we cannot rule out the possibility of some degree of investigator bias. Since individual coders in the CBIE team often disagreed in the coding process, there was a possibility for procedural bias, but since coders came to agreements to generate the final dataset, these biases were addressed. This, however, does not rule out the possibility that another coding team could produce a coding with a different set of biases. Addressing this form of procedural bias requires greater communication, collaboration, and infrastructures for sharing datasets among research teams. In the case analysis below, we demonstrate some of these difficult coding decisions that may lead to bias. Procedural bias can be partially prevented by developing and testing a codebook with detailed instructions for coders to follow. It is important to note that the lines between these biases and errors can be blurry. For example, since investigators do not conduct exhaustive analyses of the factors affecting CPR system outcomes, and we only consider un-coded additional information found explicitly in the case-studies for our qualitative analysis, alternative variables are also not exhaustive. On the other hand, if our coding procedure is biased in such a way that our coding misinterpreted the meaning of a variable, then we may erroneously find that a variable is, or is not an important predictor of outcomes. There may still be important variables to uncover. While our approach cannot correct for the biases in the literature, we can correct for the biases in our process of selecting the variables of concern, and coding. This highlights the importance of continued iteration between large-N analysis, qualitative analysis, and more detailed case study research. We will show that despite these limitations, our qualitative analysis of quantitative case studies vastly expands our ability to explain CPR system outcomes. If an inconsistency is attributed to “substantive error,” it has the most significant implication in our approach since it may offer an alternative explanation for an outcome. Substantive errors may originate in the codebook development phase because it is during this phase that coders are given instructions on what to look for, and also what to ignore. Below, we conduct a post-hoc qualitative analysis of Baggio et al.’s (2016) quantitative results. For each case, we discuss 1) the original author’s explanation for the outcome, and 2) the methodological challenges the coding team faced when coding these cases. We then discuss the implications of our findings for dealing with missing data, methods for conducting large-N case studies, and understanding DPs in relation to context. Table 2 indicates the presence and absence of DPs, and missing data. This table clearly demonstrates that Type II inconsistencies had many more missing data. Missing data is a significant limitation to large-N case studies. Ostrom et al. (1989) recommend that missing data should be addressed by using exclusion criteria to limit coding efforts to those case studies with sufficient data. The coding project at CBIE was developed to re-visit and expand on the analysis conducted by Cox et al. (2010), and thus our study is limited to the inclusion of cases with missing data. Cox et al. (2010) examined the relationship between DPs and success individually, which may explain their inclusion of cases with many missing DPs. Baggio et al. (2016) addressed this challenge by examining the sensitivity of results to assuming that missing principles were either present or absent. Table 2 also indicates that some DPs are more often absent than others. Baggio et al. (2016) found that data on graduated sanctions (5), monitor accountability (4B), and proportionality between benefits and inputs (2B) were often missing in cases. Thus, it is often difficult to rule out the importance of these DPs without further information. In our subset of nine cases, 2B is missing in seven cases. Present (1), absent (0), and missing design (blank) principles coded by Baggio et al. (2016). Based on the analysis in this article, we have highlighted suggested revisions of the coding dataset in parenthesis. Cases with some coder disagreement on success are indicated with a “*”. Table 3 summarizes the type of resource sector, geographic location, cause of inconsistency, and type of error or bias we found. We found evidence for investigator bias in three cases, procedural error in seven cases, and substantive error in eight cases. Investigator biases occurred where primary studies did not consider the full set of DPs, and these missing data may explain outcomes. Procedural bias occurred where evidence suggested that coders had miscoded a variable, or where the division of cases into independent time-periods explained inconsistencies. Substantive error was evident in cases where investigators provided alternative explanations for outcomes, or where the large-N analysis did not account for the importance of an individual DP to the specific case outcome. In the following sections we will discuss the importance of these local and non-local factors in each case. Identification and characteristics of inconsistent cases. These cases represent CPR systems in which a high number of DPs were not sufficient to avoid over-exploitation of resources and/or increased conflict within the community. An assessment of such cases leads to a handful of reasons why DPs may not be sufficient: essential principles were absent, the CPR system experienced a disturbance (e.g. market integration) that changed incentives structures or impacted closely linked resources resource users have not historically managed. However, even in the case of Type I inconsistencies, the relevance of missing data cannot be ruled out. Graduated sanctions were missing in two cases, proportionality between appropriation and provision rules (2B) were missing in three, and congruence between rules and local conditions were missing in one case. The original authors may have underestimated the importance of these DPs, or they may be implied by the author’s analysis. Nevertheless, these authors highlight important processes that led to outcomes that our coding team coded as unsuccessful. The case of the Yuracaré exemplifies the influence of market integration on CPR governance. The Yuracaré governed the use of forest resources in their territories prior to contact with the Bolivian government. They maintained resource boundaries, collectively crafted rules, and controlled use of and access to forest resources at different levels, including the clan, the “corregimiento” (consisting of one or more clans), and the territory. Representatives from each clan elected a leader, and each corregimiento had representatives that participate in tribal council meetings. These meetings were used to resolve disputes with other indigenous groups, and between those with access to resources within the Yuracaré territory. The Bolivian government recognized the Yuracaré management system in the 1990s, and codified their petitions for land tenure. Becker and Leon (2000) demonstrated that the Yuracaré management system ensured the sustainable and stable harvests of fruit trees and game animals. But Yuracaré communities were introduced to new incentives as they became increasingly integrated into the market economy and wider social fabric. In its historical context, Yuracaré self-governance exhibited congruence between appropriation and provision rules and local conditions, but these conditions were changing. In response to increasing market demand for commercial timber species, such as mahogany and Spanish timber, Yuracaré forest associations privatized and distributed timber species among families within their boundaries. While Yuracaré placed a high value on traditional fruit trees and game animals, they viewed timber trees as “surplus.” Given the high market value for these species, Yuracaré resource users over-exploited timber species, which decreased the biodiversity of the forests in the region. These developments led to the overall degradation of the forest ecosystem in the Yuracaré territory. In essence, market integration exposed the hidden fragility of the Yuracaré self-governance regime to the market demand for timber resources. This fragility eventually led to the degraded condition of the forest ecosystem. Coders disagreed in an important area relevant to this case. One coder argued that the appropriation rules were congruent to local social and ecological conditions, citing Becker and Leon’s (2000) statement that Yuracaré’s “institutions reflect [a] landscape-level concern for sustaining their resource base” (173). The coding team, however, concluded that this was not sufficient information to conclude that 2A was present or absent. Our qualitative description of the case, however, suggests that 2A is present for valuable fruit species, but absent when we consider the resource system including closely linked and interdependent species in a multi-resource system. This assessment suggests that 2A should be re-coded as absent in this case. Based on this assessment, we concluded that this inconsistency stemmed from a potential procedural error; a miscoded DP. However, we also found important contextual information demonstrating the importance of the identity of the DP; the congruence between rules and local conditions when conditions change. Baggio et al. (2016) identified the presence of nine DPs in the Ranvahi forestry case. Ranvahi resource users had an executive management committee, consensus-based decision-making to develop rules, well-defined boundaries, and 24 hour patrolling to protect their forest from outsiders. But while Ranvahi villagers successfully monitored and defended their territory from poachers from neighbouring villages, they remained lenient to authorized resource users. Thus, only neighbouring villagers were likely to have faced graduated sanctions for their rule infractions, while Ranvahi villagers were not. Ghate and Nagendra (2005) suggest that this leniency resulted in increased rule infractions, and resource users became increasingly frustrated with their management system. Ghate and Nagendra (2005) found that a non-governmental organization (NGO) limited the Ranvahi villagers’ ability to sanction those who overexploited forest resources. The NGO was concerned that recommending sanctions would create antagonism in the community, and that this would compromise the NGO’s ability to implement additional programs. Ghate and Nagendra’s (2005) suggestion that resource users were frustrated with a lack of graduated sanctions implies that this principle seems closely related to DP 2B; the proportionality between benefits determined by appropriation rules and costs determined by provisioning rules. Resource users who invest resources into the management system do not see the benefits of their investments, since some resource users can choose to ignore the appropriation rules without consequence. In fact, the coding team at CBIE struggled with contradictory evidence when coding DP 2B in this case. On the one hand, Ghate and Nagendra (2005, 519) stated, “because members go unpunished, even after repeated offenses, members who follow rules perceive this as unjust.” This suggests that 2B is absent. On the other hand, coders cited Ghate and Nagendra’s (2005) statement that the revenue earned from forest contracts were distributed to households according to the amount of work done. Coders were unable to come to an agreement on whether DP 2B was present, absent, or missing, and cautiously decided to code it as missing. Our assessment suggests that while there may be revenue distribution mechanisms, overall, the benefits obtained from investing in the management systems may not be proportional to the appropriation rules because graduated sanctions are not included among the rules. This re-assessment, however, would not affect our characterization of this case as a Type 1 inconsistency. Instead, the case was inconsistent with Baggio et al. (2016) due to substantive error; we considered only the number of DPs as relevant to success. Clearly, the case of Ranvahi indicates that it was the identity of one particular critical DP that precipitated an unsuccessful outcome. The presence of other less critical DPs, for this particular context, cannot make up for the absence of one critical DP. This case again highlights the limitations of looking at single DP’s in isolation in large-N studies. That is, statistical statements linking the presence of a single design principle to increased frequency of success in a sample of case studies are difficult to interpret at best, and, in some cases, may have little or no meaning. The cases of Sol y Arena and Sol y Poniente demonstrate the importance of external, contextual forces generating feedbacks that give rise to resource overexploitation (See Villasante and López-Gálvez 2001). Both cases refer to an area spanning around 300 km2 in the south of Spain in the Almeria region. The region is famously known for their agricultural exports. Baggio et al. (2016) found the presence of nine out of eleven DPs in both cases. However, both have experienced resource over-exploitation, scarcity, and a steep decrease in water quality in recent years. Although nine DPs were coded as present, several factors have contributed to ineffective resource governance. First, a high demand for agricultural products incentivized farmers to modernize and adopt more efficient drip technologies. But at the same time, farmers increased the area of land under irrigation. The extension of irrigated land was greater than efficiency gains from new drip irrigation, and thus farmers ended up using more water overall. This resulted in water scarcity and an increased rate of salinization of the aquifer used for part of the water extraction. Farmers had access to water shares through the irrigation community, or through privately constructed wells. Wells and groundwater pumping technologies have allowed farmers to access water easily and to drill deeper wells as groundwater levels declined. Additionally, while well technology masked signals of resource decline, the irrigation community did not have a means to effectively monitor the condition of groundwater, despite having active monitors. Thus, despite the presence of nine of eleven DPs, problems arose from the combination of incentives for agricultural expansion, the adoption of new well technology, a lack of monitoring of all water sources and uses, and private and common property rights for two CPRs. Importantly, the appropriation rules for these systems were not proportional to social and environmental conditions (2A). The proportionality of rules to local conditions was no longer tenable as economic, social, and technological conditions changed. Thus while the principle of congruency between rules and local conditions was essential to understanding these cases, it was also necessary to pay attention to how technology and economic conditions changed this congruency over time. Similar to the case of Yuracaré, these cases point to a substantive error leading to our characterization of this case as inconsistent. The lack of congruence between rules and local conditions was an essential element to the unsuccessful outcome. However, we also found evidence for a procedural error. In this case, the coding team coded DP 4A for monitoring resource conditions and resource users as present. The discussion above indicates that monitoring is only partially present, and the difficulty of monitoring aquifer withdrawal is an important element in explaining the outcome. We found one case with the same configuration of present DPs to Sol y Arena and Sol y Poniente, but with a different outcome. This case further exemplifies how CPRs with a lack of congruency and graduated sanctions are vulnerable to changing context. Tucker (1999) describes the case of La Campa, a forest CPR community in Honduras. Similar to Sol y Arena, and Sol Y Poniente, nine DPs are present. In La Campa, rules were not congruent to local conditions (DP 2A is absent), and that graduated sanctions were not being applied sufficiently (DP 5 is absent), and resource abundance had diminished. However, this decline in abundance did not constitute overexploitation at the time period discussed. Tucker (1999) argued that these absent DPs may weaken this CPR when exposed to disturbances, and that economic influences on community members to convert community forests into coffee plantations or other non-forest uses may result in overexploitation in the future. Insights based on our assessment of Sol y Poniente and Sol y Arena further support her argument. La Mancha Oriental is a region located in the south east of Spain near the cities of Albacete and Ciudad Real (See Hernández-Mora and Gunn 2001). La Mancha Oriental’s aquifer spans around 8500 km2. Irrigation development and agricultural intensification started during the 1970s and accelerated during the 1980s. Similar to Sol y Arena, and Sol Y Poniente, farmers in La Mancha Oriental were also influenced by incentives to increase production of more water-intensive crops, and had similar problems monitoring groundwater. In this region, however, problems emerged as disparities grew between upstream and downstream communities. Castilla La Mancha (CLM) farmers increased their use of groundwater for agricultural production, which reduced water availability in the Jucar River. Conflicts arose because the Jucar River provided irrigation water to the downstream Communidad Valenciana (CV). As farmers in CLM responded to new economic incentives, a previously unknown externality emerged affecting CV downstream, but the governance system had not yet generated rules to deal with or anticipate this externality. This finding suggests a procedural error associated with our coding of DP 2A. While 2A may have been present for CLM, the relevant scale of the CPR had changed, and DP 2A was no longer present for the full spatial extent of the CPR. There were signs, however, that farmers in CV and CLM were actively responding to these emerging problems. They formed an association, the regional platform for Jucar defence, to craft institutions to share water between communities. Under this association, CV farmers have agreed to reduce their water consumption. Thus, while new conditions generated incongruence between rules and local conditions, the La Mancha Oriental has demonstrated the potential to respond to new conditions. At the time of analysis, La Mancha Oriental was coded as unsuccessful, but this label may be short-lived as farmers and the governance regime adapt their farming practices and institutions to social, economic, and ecological signals. This case and the cases of Sol y Arena and Sol y Poniente demonstrate the dynamic nature of congruence, and the need for flexibility and adaptability of governance regimes for social-ecological robustness. Thus, the inconsistency in this case again stemmed from a substantive error; our qualitative analysis suggests that the specific DP 2A was an essential element to explaining the outcome where social and ecological conditions were changing. The following four cases represent CPR systems in which very few DPs were detected, yet the coding team characterized the case as successful. As we noted above, missing data makes it impossible to know how many DPs are present. Thus, while they are inconsistent with our findings, further investigation may reveal that these cases are consistent with commons theory (i.e. eight or more DPs were in fact present). We have no basis to examine the role of the DPs in explaining outcomes of these cases because of missing data. We can, however, highlight the methodological challenges these cases illustrate, and examine the original author’s explanations for outcomes. Thus, a qualitative analysis of these cases leads us to postulate how other variables may interplay with the DPs in determining success: lack of market integration, resource abundance in relation to population size, internal cohesion of communities due to kinship ties, technology, and time-lags and political economic shifts. Our analysis also revealed important methodological challenges to coding and analysing these cases. Above, we showed that market integration can incentivize villages to over-harvest commercial species, especially when they are not considered to be a part of the traditional CPR system. The case of the Huaorani in Ecuador further supports this argument by demonstrating that a lack of market integration may inhibit over-exploitation of forest products (Lu 2001). The pre-1990s Huaorani inhabited the forests of Ecuador, located in Napo, Orellana, and Pastaza provinces. Their economy was based on hunting, gathering, horticulture, and fishing. The Huaorani asserted ownership status over their territories, and had some institutions constraining forest use, maintained by mutual trust, reciprocity and kinship ties. They monitored for encroachment from outsiders and maintained social boundaries that define common and private spaces. But these institutions were highly informal and embedded within implicit cultural understandings. Huaorani institutions focused on social boundaries, rights of prior appropriation and reciprocal benefits of sharing. There were no rules limiting the amount of resources a Huaorani individual or family could harvest. Huaorani only harvested to meet subsistence needs. Thus, in the absence of markets that incentivize the production and sale of commodities, the simple and minimal CPR regime of the Huaorani was effective for preventing resource over-exploitation. This seeming success, however, was not robust to the demographic and economic changes that would occur at the end of the 20th century. The fragility of the contemporary Huaorani CPR regime was exposed as it became increasingly integrated into the Ecuadorian state and market economy. The Huaorani have increasingly participated in the burgeoning market economy, which incentivized a higher rate of forest resource exploitation. Exploitation also increased with an increasing population seeking to meet subsistence needs, and the increasing availability of technologies that improve harvest efficiency. In addition to these forces, the Ecuadorian government centralized power and populations in the region. Huaorani communities are now sedentary and composed of larger groupings with mixed non-kin and immigrating non-Huaorani residents. These mixed communities no longer exhibit the level of social cohesion, kinship ties, and accountability structures that existed in the historical case. Lu (2001) provides examples of free riding, stealing, and over-exploitation that became increasingly common as kinship and social ties eroded. A view of the Huaorani over time also reveals the fragility of land tenure when powerful groups take interest in these lands. The Ecuadorian government has granted concessions to foreign companies for oil production in Huaorani territories. Lu (2001) notes that this has undermined the Huaorani sense of control over their resources. Thus, once well-defined resource and user boundaries are now much more uncertain and ill-defined. In this case, non-state actors were powerful corporations, with greater power and influence over the Ecuadorian state and institutions that affect the Huaorani CPR governance regime. Baggio et al. (2016) followed the case definitions from Cox et al. (2010) in which one “case” was divided into separate time-frames. The Huaorani case was divided into a historical (pre-1990s) and a contemporary case. This division of cases is problematic because it complicates statistical analysis, since these cases are interdependent. Also, it leads coders to use an incomplete picture of what constitutes a “case” to assess outcomes. When we qualitatively re-visited this case, considering both time-frames, we observed longitudinal processes that provide insight into how the fragility of a CPR governance regime became apparent over time. Thus, though these cases were coded as successes in the first time step, they were subsequently coded as unsuccessful as the ecological degradation and breakdown of informal institutions became apparent. We found that the characterization of this case as inconsistent is problematic due to the prevalence of missing data. In the historical Huaorani, there may be as few as five or as many as seven DPs present (DP 7 is not applicable to this case because the Huaorani had not made contact with the Ecuadorian government at this time). Some coders suggested that the historical Huaorani had appropriation rules proportional to inputs (2B) and graduated sanctions (5). Lu (2001) pointed out that resource users engage in social pressure and gossip, but did not provide sufficient detail to assess whether these measures constituted graduated sanctions. The coders were instructed to avoid a western-centric focus on formal rules, and to look for clear evidence of any formal or informal arrangements that would constitute DPs. Lu (2001) states that the “Huaorani social organization is leaderless and decentralized, with few limits on individual autonomy and few social obligations.” This led to a high degree of disagreement in the coding process. Our examination of this case, however, provides evidence to support the speculation that the majority of DPs were missing because they were not applicable. Ostrom (1990) argued that if there is no or very little resource scarcity, then users will not invest in costly institutional arrangements (i.e. DPs). In these cases, we would not expect to see institutional arrangements represented by the DPs emerge. The historical case of the Huaorani illustrates this point. Resource scarcity only emerged in the contemporary case as internal and external pressures on resources increased (Lu 2001). In the historical case, resources were abundant, and thus rules and collective-choice arrangements were not needed. This suggests that the historical case of the Huaorani does not fit the necessary criteria for inclusion in an analysis of the relationship between DPs and outcomes as there was no CPR-related social dilemma to address. In contrast to the Huaorani, the villagers in Nyamaropa communal area, Zimbabwe, did not have any sense of territoriality. Mandondo (2001) argued that the most important combination of factors affecting resource use was the spatial distribution of resource users in relation to the distribution of resources. This spatial relationship had implications for household labour that limited resource use and over-exploitation of woodland resources. This was especially the case for bulkier woodland products such as fuelwood, kraal, or fence posts, wall and roof poles, and brushwood. Villagers preferred to collect these products locally because they were relatively abundant. Among the few villagers who suggested that woodland products were not locally abundant, they preferred to collect locally available substitutes rather than travel long distances to obtain these products. These distances presented high labour costs to households. Villagers travelled further distances to collect lighter woodland products, such as mushrooms, medicinal herbs, and wild fruits. These resources, however, were also highly abundant. Mandondo (2001) suggested that the extraction of these products would likely have less of an impact on the forest than widespread extraction of timber and fuelwood. Coder discussions described Nyamaropa as an unusual case, with little information available to assess the presence or absence of DPs, or whether Nyamaropa was a success due to some form of collective arrangement. As in the case of the historical Huaorani, the DPs may not apply because resource users have not experienced scarcity, and thus, have not needed to invest in developing institutions. The coding team could not find sufficient evidence to suggest that Nyamaropa had formal or informal institutions that would constitute management of the overall CPR system, only evidence of institutions to manage some portions of the system. The Nyamaropa communal area did have some land tenure systems, including homestead plots, and a prohibition on commercial extraction and extraction from sacred areas. Villagers developed this simple prohibition on commercial extraction to limit the impact of market incentives, which could otherwise incentivize surplus extraction (Mandondo 2001). As in the case of the historical Huaorani, these findings suggest that this case is not appropriate for the analysis of the relationship between DPs and outcomes. The case of the Oyster harvesters of Apalachicola bay, Florida, demonstrates that kinship ties and social cohesion are sometimes foundational to sustainable harvesting strategies (See Pinkerton and Weinstein 1995). This group of resource users maintained resource boundaries, monitored the conditions of the resource, and developed simple rules that have been codified by Florida authorities. Though the Oyster beds of Apalachicola bay were officially open-access, resource users maintained tenure informally through tight bonds between harvesters and processors in the region. They achieved this by excluding outsiders from access to critical information regarding oysters, the fishery, and the local fishing industry. Apalachicola bay harvesters placed a high value on the resource and on their shared identity, and maintained tight local social networks to maintain the resource. Rules mediating technology also played a role in the success of the Apalachicola bay CPR system. Members of this community prohibit the use of efficient technologies for harvesting Oysters, and only permit the use of labour-intensive tongs. Florida harvesters have cooperated on the enforcement of this rule. This limitation not only limits the efficiency and rate of exploitation, but also improves the selectivity of harvesting. This institution suggests some congruence between rules and local conditions, but we concluded that there was not enough information to mark this principle as present. Also important to this technology rule is its implications for community control of knowledge. New technologies require a different type or amount of knowledge of local resources for harvesting. The Apalachicola technology rules have excluded outsiders from accessing the resource by excluding them from the social networks that maintain the knowledge needed to harvest the resource using these methods. The success of this case may be due to the presence of all DPs, but there is no information available to support or reject this claim. In the coding process one coder believed that as many as 8 DPs were present, but others argued that this coding was too speculative, and not based on available information. Based on information, we may speculate that rules limiting technology are sufficient to establish congruence between rules and local conditions. Also, since harvesters have a “tradition of internal co-operation” and have strong kinship ties, we may also speculate that harvesters have informal mechanisms to make collective decisions, resolve conflicts, and may rarely need to deal with non-compliance by applying sanctions. Thus there are two potential conclusions from an analysis of this case; 1) the social cohesiveness of Apalachicola bay harvesters obviates the need for many DPs, or 2) many DPs are present, and thus, this case is not inconsistent with Baggio et al.’s (2016) findings. The case of Lake Chilika also demonstrates the important element of time. Lake Chilika is Asia’s biggest salt-water lake, on the eastern coast of India. The boundaries of the resource are well defined due to the geographic delineation of the catchment unit. In the pre-1990s time frame, fish harvesters engaged in collective action through fishermen’s cooperative societies and cooperative marketing societies. These organizations are nested within, and negotiate with state departments, including the Revenue department, which manages land and resource tenure, and the Department of Fisheries and Animal Resource Development, which oversees fisheries management, research, and training. The first indications of fragility were evident in the 1980s, when the Revenue Department introduced new licensing arrangements, which gave outside investors the right to develop Lake Chilika for prawn aquaculture. Fish harvesters in Lake Chilika protested this policy shift, and five people were killed in conflicts in 1986. This suggests that it may have been inaccurate to code the pre-1990 lake Chilika case as a success, but Rout (2006) suggested that collective action continued, the resource was stable, and benefits streaming from the resource remained equitable through the 1980s. As a result of this policy shift, however, the aquaculture sites changed the ecology of the lake and reduced fish abundance. Fish landings were steady and sustainable from 1970 to 1990, but landings dropped to as low as 21% of historical levels in the 1990s (Rout 2006). By dividing the case of Lake Chilika into two distinct cases, Baggio et al. (2016) and Cox et al. (2010) could not account for these processes through statistical analysis alone. One coder disagreed with the team and suggested that the pre-1990s case was not successful, but the coding team concluded that the evidence for an unsuccessful outcome emerged in the 1990s, the next time-period. In the pre-1990s case, resource users had collective-choice arrangements, but their rights to devise institutions were challenged by regional government. In the 1990s case, the coders could not find information to indicate whether collective-choice arrangements remained, and only coded two DPs as present. The key factor to these conflicts and ecological problems was the Revenue Department’s lack of recognition of the rights of Lake Chilika fish harvesters to develop and maintain their own institutions for managing the lake. Thus, processes that begun in the pre-1990s time-period precipitated resource decline and conflicts in the second time-period. Our examination of what at first seemed to be inconsistent cases yielded methodological and theoretical insights that warrant further investigation. For Type I inconsistencies, it was often the specific identity of the absent DPs in a particular context that led to unsuccessful cases. Based on available evidence from a review of case descriptions provided by the original authors, four of five Type I inconsistencies were caused by either the absence, or a potential miscoding of the congruence between rules and social-ecological conditions (2A). Above, we argued that DP 2A should have been coded as absent, rather than missing in the case of the Yuracaré, and rather than present in the case of La Mancha. In both cases, this miscoding was due to difficulties determining the assemblage of species, and the spatial boundaries that constitute the CPR system. In the remaining Type I inconsistency (Ranvahi), it was the absence of graduated sanctions that led to an unsuccessful outcome, and may have resulted in the erosion of DP 2B, proportionality between rules and benefits. Thus, our qualitative analysis yielded further evidence to support Baggio et al.’s (2016) claim that congruence and graduated sanctions are more likely to be present in successful cases, and absent in unsuccessful cases. It is important to note that both missing and non-missing data are likely still important to determining outcomes. While the problem of missing data is most prevalent in what we considered Type II inconsistencies, missing data may limit our understanding of Type I inconsistencies as well. For example, proportionality between rules and benefits (2B) was missing in two cases, and graduated sanctions (5) were missing in three. In addition, other DPs are present in cases to address a CPR challenge that resource users currently or historically faced. Our analysis, however, revealed that Type I inconsistencies were unsuccessful due to the combination of context and a particular DP. A specific DP was important to CPR outcomes in a specific case in a specific context. By examining the processes of institutional change through which a CPR may move from a successful to unsuccessful outcome or vice-versa, we may begin to uncover patterns or typologies to characterize the way a CPR is challenged by or is robust to changing contexts. Our analysis also presented challenges for scholars engaging in coding projects to understand CPR governance. One challenge was finding the appropriate temporal bounds for a case. Our analysis included two cases that covered multiple time-periods. In both cases, missing data limits our assessment of the importance of the DPs. Nevertheless, we found important temporal dynamics that were missed by Baggio et al. (2016) due to their use of temporal bounds to divide cases. In cases that cover multiple time-periods, success may be temporary, or the impact of the governance regime on social or ecological outcomes may not manifest until later time-periods, or when conditions change. This may lead scholars to erroneously link a set of factors to outcomes that were caused by processes in a different time period. In the case of the Huaorani, a relatively simple social organization was successful at time 1 when resource demand was low and resource abundance was high but became unsuccessful at time 2 when external pressures eroded boundaries, and increased the demand for resources. In the case of lake Chilika, a change in policy that did not recognize the rights of resource users to organize their own institutions at time 1, moved the CPR from a successful to an unsuccessful outcome at time 2. Without considering information available for a long period of time, we cannot adequately assess the degree to which a CPR system can be said to be long-enduring (Ostrom 1990). Additionally, statistical analyses that assume each case is independent are not appropriate for analyses that consider different time-steps of the same CPR system as separate. Scheffer et al. (2003) have also demonstrated the importance of understanding the factors that contribute to the delay between a problem, recognition, and collective action to address the problem. This suggests that large-N case studies must pay close attention to the relevant time-scales to effectively assess the relationship between institutional design, social-ecological interactions, and outcomes. In some cases, disturbances that changed the scale and nature of social-ecological interactions introduced new challenges to CPR governance. This demonstrates the importance of congruence between institutions and social-ecological conditions, and that this congruence changes over time as resource users adopt new technologies, respond to new incentives from changing market relations and political conditions. DP 2A captures the connection between institutions and context, and thus condenses a large amount of information and nuance. Further, the dynamic element of congruence makes coding for this DP challenging. Case studies may provide evidence to suggest that institutions are congruent with a certain set of conditions, but further evidence may suggest that these conditions have changed. Institutions may be well matched with the needs in the community within a case study, but exploitation rates may have impacts on communities outside the well-defined boundaries of the CPR system, or well-matched institutions may not apply to newly developed technologies, or closely linked resources. Ostrom (1990) emphasized that robust CPR governance regimes were able to modify institutions over time based on previous experience, and according to collective-choice and constitutional rules. But the DPs themselves do not necessarily capture this capacity to adapt institutions to changing conditions, or the need for new constitutional and collective-choice rules when the spatial boundaries or resource composition of a CPR system change. Huntjens et al. (2012) argued that a different set of DPs are important in cases that foster adaptive responses to climate change in complex, cross-boundary, and large-scale resource systems. Our study found support for the importance of DPs such as congruence for successful outcomes, but it also supports literature highlighting the importance of innovation, robustness, and the capacity to adapt to changing interdependencies and social-ecological conditions (O’Brien and Leichenko 2000; Folke et al. 2002; Adger 2003; Anderies et al. 2004; Armitage 2007; Cundill and Fabricius 2009; Barnett and Anderies 2014; Chaffin and Gunderson 2016). Our study suggests that future research is needed to unpack the factors and elements that constitute congruence and adaptive capacity. Some cases did not have sufficient information to assess whether they were truly inconsistent with commons theory. Further, in two of the four cases, there was some disagreement among coders as to whether the case fit the definition of success. This further supports suggestions that case inclusion and exclusion criteria are important and necessary for replicable and robust case-study results (Ostrom et al. 1989; Hruschka et al. 2004; Ratajczyk et al. 2016). For example, in case studies with a high relative abundance of resources, and low market pressures, resource users may not experience CPR dilemmas, and thus, coding for DPs may be irrelevant. Future studies may consider excluding these cases, or accounting for their uniqueness by capturing the extent to which CPR dilemmas have become relevant to the system. This study and Baggio et al. (2016) also found that some DPs are more likely to be missing than others. Our study suggests that more research attention to often missing DPs such as proportionality between inputs and benefits (2B) may improve case-study comparisons by closing knowledge gaps. Despite the limitations of the Type II inconsistencies, these cases may still provide valuable information for understanding CPR governance. If we assumed that Type II inconsistencies could not be attributed to missing values alone, then the alternative explanations presented in these cases would be important to future studies. Well-defined boundaries may become ill-defined when powerful actors influence land and sea tenure policies to open up spaces for new forms of natural resource exploitation. Conflicts may arise between resource users seeking to exploit a different set of resources from a common resource system. Resource users may exhibit a high degree of social cohesion despite a lack of monitoring and sanctioning, and this social cohesion, combined with simple rules may be sufficient to lead to successful outcomes. Such simple rules include those that mediate the effects of technology or market incentives. These findings suggest continued attention to case studies and case-comparisons that consider power dynamics, multiple-use resources, and factors that contribute to social cohesion (Steins and Edwards 1999a,b; Clement 2013; Epstein et al. 2014; Barnett and Eakin 2015). Ostrom’s DPs primarily characterize soft human-made infrastructure that links to social and ecological context. In large-N case studies, the DPs condense a large amount of information into eleven binary measures. In some cases, those measures help us the predict outcomes, but there are important nuances to consider. Baggio et al. (2016) show that some combinations of DPs are more likely to lead to success than others. In this paper we complement the work presented in Baggio et al. (2016) by integrating their quantitative statistical approach with a qualitative analysis. We found evidence to recommend greater attention to investigator bias (unaccounted variables), procedural error (coding errors), and substantive errors (the importance or weight given to individual DPs, or alternative explanations) that emerge in the process of reducing primary literature to variables, and analysing the relationships between these variables and outcomes. Our focus was on examining inconsistent cases, but a qualitative analysis of consistent cases would be fruitful to identify causal-chains that explain how the DPs were implemented and the relationship between DPs and a dynamically changing context. We contributed to methodologies by demonstrating the importance of combining qualitative and quantitative analyses. There were, however, limitations to our approach. Given the scope of our study, we were limited to literature used in the large-N case study, and thus constrained by the missing elements of relevance to CPR studies. Two follow-up approaches could be used to improve our understanding of CPR governance. First, further studies could gather additional primary and secondary literature on the cases analysed here to reduce the missing values that are currently hindering a more complete quantitative analysis. We found that our study generated questions about studies with missing elements. For example, have new collective choice arrangements and institutions in Lake Chilika improved the condition of this CPR system? A recently published analysis of this system suggests that collective action and ecological integrity of Lake Chilika has continued to decline (Nayak 2014). Second, researchers could focus their efforts towards conducting standardized fieldwork to gather comparable data useful for increasing our understanding of CPR governance. Our study is only a part of a continuing process of examination, including unique cases derived from large-N studies examining single case studies longitudinally or single-cases through different theoretical lenses (Campbell 2007; Gruby and Basurto 2013; Barnett and Anderies 2014; Barnett and Eakin 2015), CPR games and experiments, and agent-based and dynamic modelling (e.g. Baggio and Janssen 2013; Baggio et al. 2015; Janssen and Baggio 2016). The DPs were originally constructed based on cases that were less drastically affected by rapid global economic and ecological change and many of these cases are not as isolated as they were historically. The single cases that make up large-N studies and case-comparisons exhibit increasing interdependencies with processes occurring at multiple levels and scales (Beck and Sznaider 2006; Young et al. 2006; Adger et al. 2009; Barnett and Eakin 2015). The challenge of global economic and environmental change also presents an opportunity for academics to better understand what factors operating at and across scales contribute to robust CPR governance regimes. How have some CPR governance regimes been able to maintain equitable and sustainable management regimes despite these transformations? What enables governance regimes to maintain the congruence between rules and local conditions as conditions change at multiple scales? By understanding the nature of these transformations, and the different sets of factors that operate in different regimes, we may be able to develop new principles for understanding how CPR systems maintain resilience or robustness within and across political, economic, and ecological regimes. The team would like to acknowledge project support from the National Science Foundation, grant number GEO – 1115054. Adger, W. N (2003). Collective Action, and Adaptation to Climate Change. Economic Geography 79(4): 387–404. http://dx.doi.org/10.1111/j.1944-8287.2003.tb00220.x. Adger, W. N, Eakin, H and Winkels, A (2009). Nested and Teleconnected Vulnerabilities to Environmental Change. Frontiers in Ecology and the Environment 7(3): 150–157. http://dx.doi.org/10.1890/070148. Anderies, J. M and Janssen, M. A (2011). The Fragility of Robust Social-Ecological Systems. Global Environmental Change 21(4): 1153–1156. http://dx.doi.org/10.1016/j.gloenvcha.2011.07.004. Anderies, J. M, Janssen, M. A and Ostrom, E (2004). A Framework to Analyze the Robustness of Social-Ecological Systems from an Institutional Perspective. Ecology and Society 9(1): 18. Armitage, D (2007). Governance and the Commons in a Multi-Level World. International Journal of the Commons 2(1): 7–32. http://dx.doi.org/10.18352/ijc.28. Baggio, J. A and Janssen, M. A (2013). Comparing Agent-Based Models on Experimental Data of Irrigation Games, 1742–1753.. Simulation Conference (WSC), 2013 Winter, http://dx.doi.org/10.1109/wsc.2013.6721555. Baggio, J. A, Rollins, N. D, Pérez, I, Janssen, M. A and Design, E (2015). Irrigation Experiments in the Lab: Trust, Environmental Variability, and Collective Action. Ecology and Society 20(4): 12. http://dx.doi.org/10.5751/ES-07772-200412. Baggio, J. A, Barnett, A. J, Perez-Ibara, I, Brady, U, Ratajczyk, E, Rollins, N, Rubiños, C, Shin, H. C, Yu, D. J, Aggarwal, R, Anderies, J. M and Janssen, M. A (2016). Explaining Success and Failure in the Commons: The Configural Nature of Ostrom’s Institutional Design Principles. International Journal of the Commons 10(2): 417–439. http://doi.org/10.18352/ijc.634. Barnett, A. J and Anderies, J. M (2014). Weak Feedbacks, Governance Mismatches, and the Robustness of Social-Ecological Systems: An Analysis of the Southwest Nova Scotia Lobster Fishery with Comparison to Maine. Ecology and Society 19(4): 39. http://dx.doi.org/10.5751/ES-06714-190439. Barnett, A. J and Eakin, H. C (2015). “We and Us, not I and Me”: Justice, Social Capital, and Household Vulnerability in a Nova Scotia Fishery. Applied Geography 59: 107–116. http://dx.doi.org/10.1016/j.apgeog.2014.11.005. Basurto, X, Bennett, A, Weaver, A. H, Rodriguez-Van Dyck, S and Aceves-Bueno, J.-S (2013). Cooperative and Noncooperative Strategies for Small-scale Fisheries’ Self-governance in the Globalization Era: Implications for Conservation. Ecology and Society 18(4): 38. http://dx.doi.org/10.5751/ES-05673-180438. Becker, C. D and Leon, R (2000). Indigenous Forest Management in the Bolivian Amazon: Lessons from the Yuracare People. People and forests: Communities, institutions, and governance. Gibson, C. C, McKean, M. A and Ostrom, E eds. : 163–191. Cambridge, MA: MIT Press. Beck, U and Sznaider, N (2006). Unpacking Cosmopolitanism for the Social Sciences: A Research Agenda. The British Journal of Sociology 57(1): 1–23. http://dx.doi.org/10.1111/j.1468-4446.2006.00091.x. Campbell, L. M (2007). Local Conservation Practice and Global Discourse: A Political Ecology of Sea Turtle Conservation. Annals of the Association of American Geographers 97(2): 313–334. http://dx.doi.org/10.1111/j.1467-8306.2007.00538.x. Chaffin, B. C and Gunderson, L. H (2016). Emergence, Institutionalization and Renewal: Rhythms of Adaptive Governance in Complex Social-Ecological Systems. Journal of Environmental Management 165: 81–87. http://dx.doi.org/10.1016/j.jenvman.2015.09.003. Clement, F (2009). Analysing Decentralised Natural Resource Governance: Proposition for a “Politicised” Institutional Analysis and Development Framework. Policy Sciences 43(2): 129–156. http://dx.doi.org/10.1007/s11077-009-9100-8. Clement, F (2013). For Critical Social-Ecological System Studies: Integrating Power and Discourses to Move Beyond the Right Institutional Fit. Environmental Conservation 40(01): 1–4. http://dx.doi.org/10.1017/S0376892912000276. Cox, M, Arnold, G and Tomás, S. V (2010). A Review of Design Principles for Community-Based Natural Resource Management. Ecology and Society 15(4): 38. Cundill, G and Fabricius, C (2009). Monitoring in Adaptive Co-Management: Toward a Learning Based Approach. Journal of Environmental Management 90(11): 3205–3211. http://dx.doi.org/10.1016/j.jenvman.2009.05.012. Degnbol, P, Gislason, H, Hanna, S, Jentoft, S, Raakjær Nielsen, J, Sverdrup-Jensen, S and Clyde Wilson, D (2006). Painting the Floor with a Hammer: Technical Fixes in Fisheries Management. Marine Policy 30(5): 534–543. http://dx.doi.org/10.1016/j.marpol.2005.07.002. Epstein, G, Bennett, A, Gruby, R, Acton, L and Nenadovic, M (2014). Studying Power with the Social-Ecological System Framework. Understanding Society and Natural Resources. Manfredo, M. J, Vaske, J. J, Rechkemmer, A and Duke, E. A eds. : 111–135. Netherlands: Springer. http://dx.doi.org/10.1007/978-94-017-8959-2_6. Folke, C, Carpenter, S, Elmqvist, T, Gunderson, L, Holling, C. S and Walker, B (2002). Resilience and Sustainable Development: Building Adaptive Capacity in a World of Transformations. AMBIO: A Journal of the Human Environment 31(5): 437–440. http://dx.doi.org/10.1579/0044-7447-31.5.437. Ghate, R and Nagendra, H (2005). Role of Monitoring in Institutional Performance: Forest Management in Maharashtra, India. Conservation and Society 3(2): 509. Gruby, R. L and Basurto, X (2013). Multi-Level Governance for Large Marine Commons: Politics and Polycentricity in Palau’s Protected Area Network. Environmental Science & Policy 33: 260–272. http://dx.doi.org/10.1016/j.envsci.2013.06.006. Gutierrez, N. L, Hilborn, R and Defeo, O (2011). Leadership, Social Capital and Incentives Promote Successful Fisheries. Nature 470(7334): 386–389. http://dx.doi.org/10.1038/nature09689. Hernández-Mora, N and Gunn, E. L (2001). La gestión colectiva de la saguas subterráneas en la Mancha: análisis comparativo In: La Economía del Agua Subterránea y su Gestión Collectiva. Mora, N. H and Llamas, R eds. : 405–475. Madrid, Spain: Fundación Marcelino Botín. Hruschka, D. J, Schwartz, D, St.John, D. C, Picone-Decaro, E, Jenkins, R. A and Carey, J. W (2004). Reliability in Coding Open-Ended Data: Lessons Learned from HIV Behavioral Research. Field Methods 16(3): 307–331. http://dx.doi.org/10.1177/1525822X04266540. Huntjens, P, Lebel, L, Pahl-Wostl, C, Camkin, J, Schulze, R and Kranz, N (2012). Institutional Design Propositions for the Governance of Adaptation to Climate Change in the Water Sector. Global Environmental Change 22(1): 67–81. http://dx.doi.org/10.1016/j.gloenvcha.2011.09.015. Janssen, M. A and Baggio, J. A (2016). Using Agent-Based Models to Compare Behavioral Theories on Experimental Data: Application for Irrigation Games. Journal of Environmental Psychology, Forthcoming. http://dx.doi.org/10.1016/j.jenvp.2016.04.018. Lu, F. E (2001). The Common Property Regime of the Huaorani Indians of Ecuador: Implications and Challenges to Conservation. Human Ecology 29(4): 425–447. http://dx.doi.org/10.1023/A:1013193821187. Mandondo, A (2001). Use of Woodland Resources Within and Across Villages in a Zimbabwean Communal Area. Agriculture and Human Values 18(2): 177–194. http://dx.doi.org/10.1023/A:1011135912806. Nayak, P. K (2014). The Chilika Lagoon Social-Ecological System: An Historical Analysis. Ecology and Society 19(1): 1. http://dx.doi.org/10.5751/ES-05978-190101. O’Brien, K. L and Leichenko, R. M (2000). Double Exposure: Assessing the Impacts of Climate Change Within the Context of Economic Globalization. Global Environmental Change 10(3): 221–232. http://dx.doi.org/10.1016/S0959-3780(00)00021-2. Ostrom, E (1990). Governing the Commons: The Evolution of Institutions for Collective Action. Cambridge, UK: Cambridge University Press. http://dx.doi.org/10.1017/CBO9780511807763. Ostrom, E, Agrawal, A, Blomquist, W, Schlager, E and Tang, S. Y (1989). CPR coding manual. Workshop in Political Theory and Policy Analysis. Indiana: Indiana University Bloomington. https://seslibrary.asu.edu/sites/default/files/cprcodingmanual-fullwcovercopytoc.pdf (accessed 16 August 2016). Poteete, A. R, Janssen, M. A and Ostrom, E (2010). Working Together: Collective Action, the Commons, and Multiple Methods in Practice. Princeton, New Jersey: Princeton University Press. http://dx.doi.org/10.1515/9781400835157. Ratajczyk, E, Brady, U, Baggio, J. A, Barnett, A. J, Perez-Ibara, I, Rollins, N, Rubiños, C, Shin, H. C, Yu, D. J, Aggarwal, R, Anderies, J. M and Janssen, M. A (2016). Challenges and Opportunities in Coding the Commons: Problems, Procedures, and Potential Solutions in Large-N Comparative Case Studies. International Journal of the Commons 10(2): 440–466. http://doi.org/10.18352/ijc.652. Scheffer, M, Westley, F and Brock, W (2003). Slow Response of Societies to New Problems: Causes and Costs. Ecosystems 6(5): 493–502. http://dx.doi.org/10.1007/s10021-002-0146-0. Steins, N. A and Edwards, V. M (1999a). Collective Action in Common-Pool Resource Management? : The Contribution of a Social Constructivist Perspective to Existing Theory. Society & Natural Resources 12(6): 539–557. http://dx.doi.org/10.1080/089419299279434. Steins, N. A and Edwards, V. M (1999b). Platforms for Collective Action in Multiple-Use Common-Pool Resources. Agriculture and Human Values 16(3): 241–255. http://dx.doi.org/10.1023/A:1007591401621. Tucker, C (1999). Common Property Design Principles and Development in a Honduran Community. PRAXIS: The Fletcher Journal of Development Studies 14: 1–23. Villasante, A. L and López-Gálvez, J (2001). Gestión del agua de riego en Campo Dalías In: La Economía del Agua Subterránea y su Gestión Collectiva. Mora, N. H and Llamas, R eds. : 367–404. Madrid, Spain: Fundación Marcelino Botín. Young, O. R, Berkhout, F, Gallopin, G. C, Janssen, M. A, Ostrom, E and van der Leeuw, S (2006). The Globalization of Socio-Ecological Systems: An Agenda for Scientific Research. Global Environmental Change 16(3): 304–316. http://dx.doi.org/10.1016/j.gloenvcha.2006.03.004.